Conserving Scotland’s landscapes, habitats and species, and promoting substantial public access and recreation, has never been more important, especially with the wider impact of climate change and developments in land use. 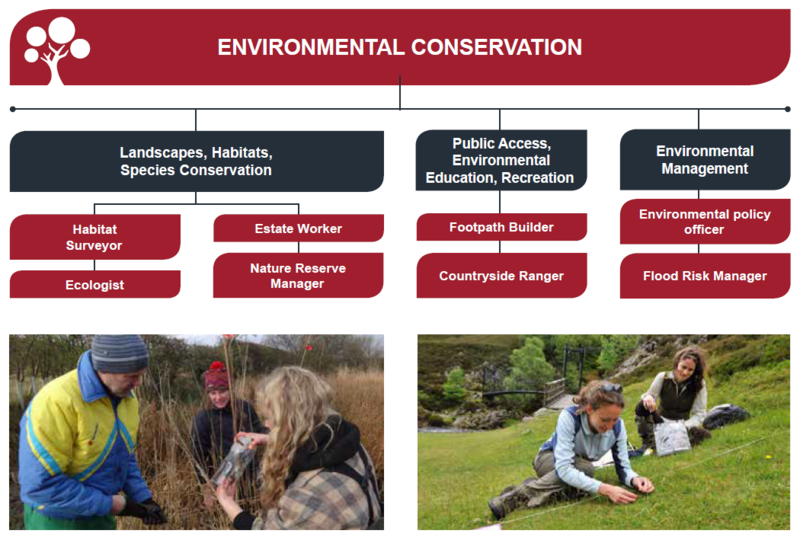 There's a real need to look after some of our more fragile landscapes and habitats in both rural and urban areas, and if you choose a career in environmental conservation and management you can make a real contribution to Scotland’s natural heritage. If you are committed to protecting the environment, have a flair for science, like the sound of working outdoors or are interested in solutions to environmental changes, a career in this diverse and rewarding industry could be for you. You may start as a volunteer warden with your local council and develop into a senior ecologist at the other side of the world, if you are prepared to work hard and develop your skills and knowledge. Take a look at the example jobs below for inspiration. Chris works as the Advisory Manager for RSPB Scotland providing land management advice to farmers, crofters, foresters and other land managers. Jamie has been doing an SVQ in Environmental Conservation while working as a trainee upland path worker with the Mountains and the People project. As a Conservation Manager around Loch Lomond, Jenny is responsible for 400 acres of woodland and wetland.